Born in Fukushima, Japan, Hideo worked for Hitachi Ltd. And in 1985, he was assigned to establish a new company, Hitachi Automotive Products(USA) in Kentucky. After growing the company to 1,000 employees, Hideo was transferred to its Los Angeles operation. While taking a volunteer role as president of the South Bay Management Seminar, Hideo learned that Keisaburo Koda was born in a village next to his, 60 years before and was deeply related to people he had known. 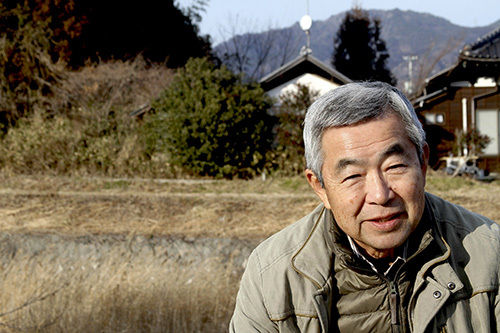 After visiting Koda Farms, Hideo introduced some important information that the Kodas wanted to know, such as the man who took care of Keisaburo before he passed away in Tokyo in 1964, as well as the family history of the Kodas since the 1500s. Hideo retired in 2008 and returned to Japan after working in the United Sates for 23 years. About 10 years ago, Hideo mentioned Koda Farms to his close friend in Los Angeles, who was interested in the story of the Rice King and promised Hideo that he would become a sponsor if someone made the movie. But his friend suddenly passed away from cancer. As the documentary movie bloomed, Ross Koda introduced Hideo to the film crew as a man who knew the Kodas very well. Hideo instantly made up his mind to dedicate his time to this movie during the production in Japan because of his precious relationship with the Kodas. Not only a successful business man, but also an undefeated civilian activist who fought for the civil rights of Japanese and Japanese immigrants, Keisaburo Koda is a great hero of Hideo’s homeland, Fukushima, and all of the current Japanese businessmen. He hopes that this movie will inspire and encourage the people of Fukushima who are still suffering from the tragic nuclear power plant incident. It is his great honor to be involved in making this documentary.